Here’s your weekly dosage of PLO knowledge – structured so you can read through it, and use the tips in this email to win money in your next session. Let’s get right into it! Rule of thumb on calling four-bets: it’s almost always correct to call with any single-suited unpaired, non-Ace hand that was good enough to three-bet in the first place with 100bb effective stacks. This week I decided to do a video review of two hands from the 2+2 forum… Let me know what you think of the new format! One of the most common questions from PLO players comes from those who don’t know which materials to begin their PLO journey with. Practically everyone who’s playing PLO sees the opportunity… The games are much softer than NL, and even though PLO training has improved over the years there are still 1000’s of players making the transition to PLO full time each day. But in order to navigate the “PLO Jungle”, you have to master the fundamentals first, and then focus on converting your weaknesses into strengths. 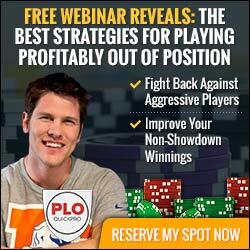 The PLO Blueprint identifies the weaknesses holding you back from building a consistent winrate, and provides you a clear path of materials to sure up the leaks in your game. 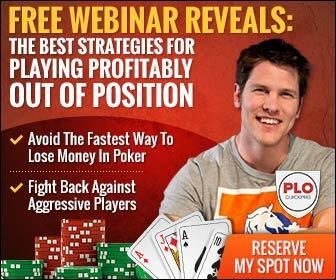 So whether you’re a new or transitioning player who wants to master the fundamentals, or a mid to low-stakes reg looking to fight back against aggressive players, your free PLO Blueprint is a great place to start. 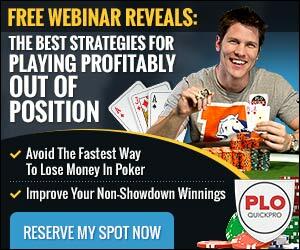 Click here to get your PLO Blueprint today!